GREAT HANDS - Friendswood's Christian Lee (6) makes a great catch against Angleton. QB Luke Grden and Lee teamed up for two touchdowns covering 14 and 43 yards to Lee to cut the margin to 35-20 with 3:10 left in the game, but it wasn't enough as the Wildcats held on for the win. FRIENDSWOOD — The table was set in Angleton when Friendswood arrived at Wildcat Stadium. There was no misunderstanding as to the outcome of the game. The Mustangs got the help they needed when Foster beat Hightower 21-20 as the Hurricanes missed a PAT to breathe hope to Friendswood in their game against Angleton. The outcome was simple. Win or stay home in the post-season for the first time since 2007. That was the scenario for the 'Stangs. Friendswood has always been a team that you didn't want to face when their backs were against the wall and this game was no different. Head coach Robert Koopmann has stated many times that he would go into battle with his warriors on any given night. Angleton (9-1, 6-1) lost to Manvel in the Class 5A Div. I state semifinal contest last season and the only loss they have had this year was to Shadow Creek (35-14) as the Sharks (10-0, 7-0) are playing in their first varsity season. On the other hand, Friendswood opened up the 2018 season with five straight wins, but finished the second half of the year dropping four-of-the-last-five district games to finish 6-4 and a ticket to watch the post-season from the sidelines. A Friendswood team had never lost three straight games under the guidance of head coach Robert Koopmann and the Mustangs showed renewed life with a 42-14 win over Rosenberg Terry to keep their playoff hopes alive in the final game of the regular season. Unfortunately, it wasn't to be as the Wildcats proved why they are a state playoff contender with a 35-20 win over the Mustangs. Friendswood's 3-4 district record featured losses to the top four teams - Shadow Creek, Angleton, Foster and Fort Bend Hightower. Friendswood was in the game with all four teams, but couldn't pull the trigger to pull out a win. "You've got to play well and make big plays against those four good teams, and we just didn't do that," Koopmann said. "In this district, it's a battle every snap. We're really disappointed for the seniors. "We (coaches) let them down. We didn't do a great enough job coaching those guys. Our effort was awesome against Angleton. We were onside kicking at the end and recovering them. These kids just didn't give up." Angleton scored first with 2:06 left in the opening stanza when quarterback Seth Cosme hit Jason Williams on a 31-yard touchdown pass. On their next possession, the Wildcats used a 65-yard scoring march for a 14-0 lead when Kendel Archie scored on a 1-yard plunge with 6:32 left before halftime which was the score at intermission. The Mustangs came out strong in the second half on their first possession following a very short Angleton punt against a stiff wind. Setting up at the Wildcats 32, Friendswood made their task much harder with three consecutive 5-yard penalties to the Angleton 47. Sophomore quarterback Luke Grden came up with a clutch 43-yard pass completion to Dawson Johnson to place the Mustangs on the Angleton 4. Another penalty once again moved the ball back to the 7 before Christian Lee put the ball on the two yard line setting up 6-3, 300-pound Michael Gibson's touchdown to cut the margin to 14-6 following a missed PAT with 7:50 left in the third quarter. The Wildcats responded with an 8-play, 75-yard scoring drive of their own to increase the lead to 21-6 with 3:06 left in the third. The Mustangs took their next possession to the Wildcat 4-yard line, but a fourth-and-goal pass from Grden to Austin Alvarez netted only two yards and an opportunity to cut the lead was thwarted. Angleton showed why their season is moving on as they got possession at their own two-yard line and stayed on the ground for a 98-yard scoring drive that took almost four minutes off the game clock to a 28-6 cushion. 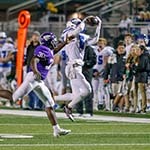 The Wildcats moved ahead to 35-6 before Friendswood got two scoring passes covering 14 and 43 yards to Lee to cut the margin to 35-20 with 3:10 left in the game. 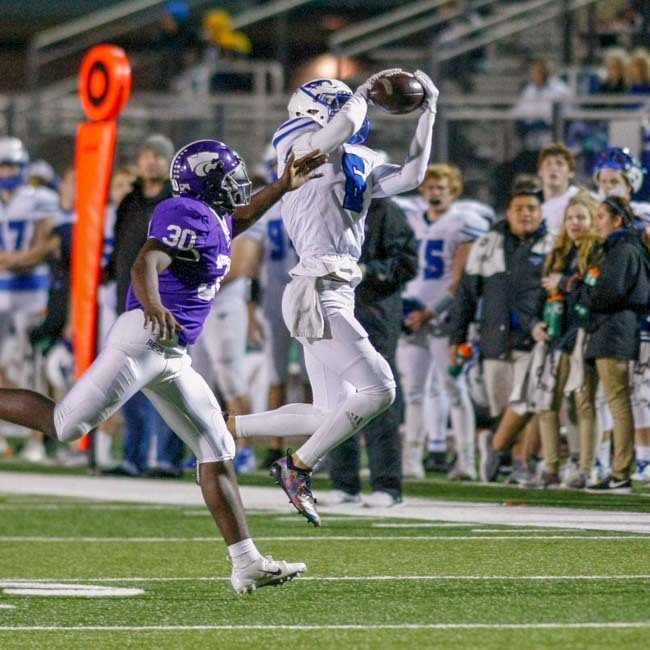 The Mustangs recovered an Angleton fumble and an onside kick in the closing minutes, but Friendswood suffered a couple of pass interceptions to end all hope of advancing in the post-season. "This game has kind of been the story of what we've done all year - hit-and-miss on offense and going through droughts," Koopmann said. "We have to be so precise on offense and go on these eight-, nine-, 12- and 13-play drives. Against a defense like Angleton's, it's really hard to do. "I'm disappointed for the kids. These seniors worked their tails off for four years." Friendswood closes out the season with a 6-4 record and miss the playoffs for the first time under Koopmann.